This entry was posted in Military, Religion, Society and tagged calendar, Christmas, Egypt, Jesus, Jews, Mithraism, Mithras, monotheism, Paul, polytheism, Saturnalia, winter solstice, Xmas. Thanks for this. I did a bit of digging and it has put Mithras into place for with re. the epochs. After the age of Aries comes, of course, the age of Pisces, the age of Christianity. And Pisces is now finished, and we’re into the Age of Aquarius… the age of Global Warming? Thanks, Robin: that’s really interesting. I’m going to go and read Ben Best’s page now. It’s interesting how other pagan rituals or artefacts also got tacked onto Christmas in some countries. I think Celtic druids began independently of Mithraism, although the two probably merged as the Roman empire spread. But misteltoe – the hibernal dwelling of the spirit of the oak-king for the druids – has significance in other mythologies, too. I’ve read that it should always be hung out of reach because of the mischievous use to which it was put by Loki in bringing about the death of Baldur. I’m sure Norse & Teutonic myths have common roots with Celtic & Roman ones but it’s interesting to find something so apparently insignificant as misteltoe turning up in both branches. Thanks for the comments, Gordon. I should mention that Ben feels I am in error in allowing the impression that Paul was the creator of Christmas as we know it. My bad – I didn’t mean to imply that it was Paul’s creation. However, I feel that Paul actively promoted the religious syncretism that allowed the merging of Mithras, Saturnalia and Christianity. Be that as it may, I hope you enjoy Ben’s rich and rapid overview of the forces that influenced the world’s biggest holiday. Hi Sandra, I really eenoyjd reading this post. You have such a wonderful writing style. Every time I hear the word cult, it’s hard to not be surprised, but being lowered in that pit with the blood of a bull being poured on me would freak me out. No doubt I would not have passed the ritual test. The frescoes are really interesting too and the fact that some churches are built over these places. Thank you so much for writing this post and sharing another interesting discovery in Rome’s history. Hope you’re having a wonderful 2013 so far. Sarah? Who? Frescoes? What? The mystery religion deepens. 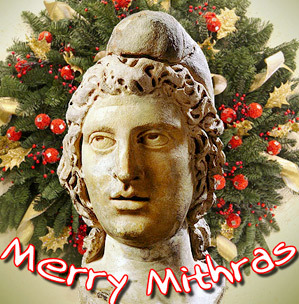 Mithras is the statue of liberty. or the statue of liberty is Mithras rather. 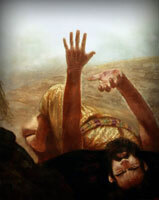 Just because a lie has been perpetrated for over 2,000 years doesn’t negate the truth. There is nothing in the pages of the Holy Scriptures that points to Mithraism. David, I appreciate that attitude. Just because something has been said or written down for 2,000 years doesn’t make it true. Such statements should be verified objectively and scientifically. Some statements from that long ago stand up very well to investigation, and some don’t. I hope you apply your critical thinking widely! Thanks for the comments, Gordon. I solhud mention that Ben feels I am in error in allowing the impression that Paul was the creator of Christmas as we know it. My bad I didn’t mean to imply that it was Paul’s creation. However, I feel that Paul actively promoted the religious syncretism that allowed the merging of Mithras, Saturnalia and Christianity. Be that as it may, I hope you enjoy Ben’s rich and rapid overview of the forces that influenced the world’s biggest holiday.